Wait, was that the question? It depends. If I have some movies from my ghetto Netflix queue (a.k.a. The Library) I tend to watch those. They pretty much have to be English-language though; subtitles are a problem because I find myself looking up and down constantly and making stupid mistakes. Yesterday I watched La Vie En Rose, and I can’t help but wonder if my inability to be impressed with it had less to do with the non-linear story arc and underdeveloped characters than with the irritation I experienced trying to untangle my Manos. Wasn’t that also the movie that made Kate say she was going to stop, er… tying one on? Recently I re-watched the entire Twin Peaks series. I completed exactly one pair of socks. 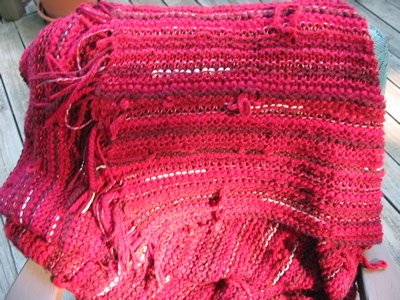 I was much more prolific during the first viewing, when I knit a big throw. This time I was kind of shocked by the last episode all over again because I didn’t really remember what happened. Again, maybe knitting getting in the way of full comprehension. I also like to listen to podcasts sometimes, usually NPR, This American Life, or the Savage Lovecast. My boyfriend got me listening to the Dr. Joy Brown Show, which if you don’t know is a radio call-in advice show hosted by a no-nonsense kind of therapist lady. He listens to her before bed because it is calming and helps him sleep. I hope that he would not be too embarrassed that I tell the world (ok like four of my knitting friends) this. And musically I have been rocking out to a new old ‘lab I found, as well as Suburban Kids with Biblical Names. I would tag Sabre, but I don’t know if she actually reads this blog. that’s really all the comment I can muster at this point in the day. Except to say that I will be checking out the Dr. Joy Brown Show, so we can have some excellent conversation (or obnoxious comments) the next time I see you and the boy. I haven’t been the same since that movie. She also inspired me to bring knitting to the beach last summer. Aw, that scene was so sweet. I remember you talking about it then, and though I did have reservations at first about sand and sunblock getting all up in the yarn fibers… maybe I’ll do some of that in Florida next week!